I finished New Kid and Once I Was Cool this week. I also finished up a course I was in this year for school so that felt amazing! I'm going to go back to Dealing in Dreams and I have a few writing prompt books from the library that look super cool. I might also have a couple bags of other books from the library too...there's a blend of picture books and professional books I'm hoping to dive into this week. If you didn't see my announcement, I wanted to share that I'll be TEACHING again next year and I. Am. So. Thrilled! I couldn't be more excited. I'll be teaching 8th grade ELA/SS and supporting our English Learners so I've been reading more YA and thinking about how I want to structure the time I have. Woo hoo!!! Congrats on finishing your class. Thanks for hosting. I hope you have a nice week. So happy to hear you'll be going back to teaching this next year. And congratulations on finishing your class. I'm hearing such great things about New Kid -- can't wait to get my hands on it. Have a wonderful week, Jen! Welcome back to the teaching community! Hope you have a great reading week ahead of you. 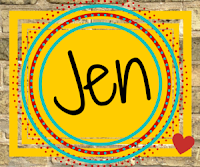 Congratulations on finishing your course and your teaching gig Jen! My library doesn't have Once I was Cool, but it does have The Wrong Way to Save Your Life by Megan Stielstra. I've added it to my for later shelf. Yay for teaching again! I have New Kid ordered and can't wait to get started with it.